New 2017 health laws: Are you ready? The California Legislature had an active year, passing many new laws affecting health care. In particular, there was a strong focus on health care coverage, drug prescribing, public health and workers’ compensation issues. CMA has published a summary of the most significant new health laws of interest to physicians. For more details, see "Significant New California Laws of Interest to Physicians for 2017." The Rose Ballroom at the Vintners Inn was full on Tuesday evening, Dec. 6, as SCMA honored Drs. Jerry Minkoff, Gary Barth, and Rob Nied with Outstanding Contribution awards. Dr. Veronica Jordan received the Sonoma Medicine Article of the Year award, and Partnership HealthPlan of California received a Recognition of Achievement. SCMA President Dr. Regina Sullivan acted as emcee for the gala event, holding with alacrity the attention of more than 100 doctors, spouses and guests. SCMA is accepting updates for the 2017 Sonoma County Physician Directory until Dec. 16. Contact Rachel Pandolfi at 707-525-4375 or rachel@scma.org. The directory features photographs and detailed listings for all SCMA members, including their specialty(s), special medical interest and medical training. Basic information for nonmember physicians is included as well. Need extra copies of the 2016 Sonoma County Physician Directory? Get them now for $10 while they last: that’s a $20 discount! Contact Rachel Pandolfi at 707-525-4375 or rachel@scma.org. Cynthia Melody, who celebrated 25 years with SCMA in October, announced her departure effective Dec. 31, 2016. Click here (link to pdf A) to view Melody’s departure letter. Initially recruited to manage SCMA committees, programs and projects, Melody has served as executive director since 2000. She’s also served as executive director for the Marin Medical Society since 2007 and the Mendocino-Lake County Medical Society since 2010. MMS is in negotiations with the San Francisco Medical Society to merge the two organizations into the San Francisco-Marin Medical Society. MLCMS will be administered by the California Medical Association. For details and a description of the new SCMA executive director position, contact Mike Steenburgh at mike@cmsservices.org. In addition to the featured tip, this monthly one-page publication is a great reminder for practice managers and physicians about other CMA benefits available. Click here to see "Don't lose revenue by not working denials." Fertility clinic for sale - Santa Rosa Revenue $1.7 million on 32 MD hours/week. 3,800 square feet includes OR, 3 exam rooms, 9 offices/private, 2 storage rooms, embryology lab, and blood/sperm lab, plus kitchen. Very attractive, atrium-style building. Independent appraisal available; photos available. Offered at $815,000. Contact Medical Practices USA for more information at Info@MedicalPracticesUSA.com. 800-576-6935. Free classifieds for SCMA members! 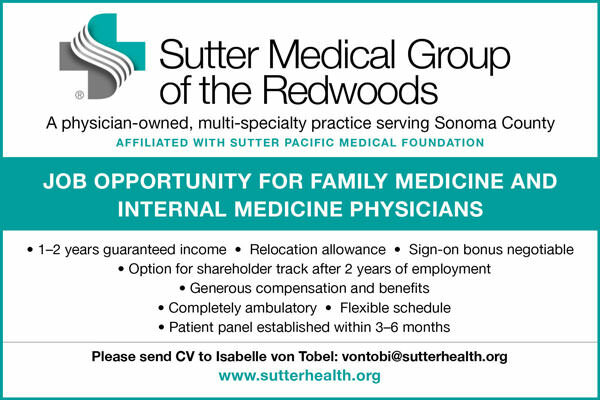 SCMA members can place FREE classified ads in News Briefs or Sonoma Medicine. Cost for nonmember physicians and the general public is $1 per word. To place a classified ad, contact Susan Gumucio at susan@scma.org or 707-525-0102. Support your colleagues and attend the Awards Dinner! It's a great evening of recognition and appreciation for our medical community. Three physicians will receive Outstanding Contribution awards: Dr. Jerry Minkoff, for Outstanding Contribution to the Community; Dr. Gary Barth, for Outstanding Contribution to Sonoma County Medicine; and Dr. Rob Nied, for Outstanding Contribution to SCMA. The Sonoma Medicine Article of the Year award will be presented to Dr. Veronica Jordan and Partnership HealthPlan will be honored with a Recognition of Achievement. Tickets are FREE for SCMA members. For more details about the gala evening and to RSVP, see the dinner invitation. Cynthia Melody, who celebrated 25 years with SCMA in October, has announced her departure effective Dec. 31, 2016. Initially recruited to manage SCMA committees, programs and projects, Melody has served as executive director since 2000. She's also served as executive director for the Marin Medical Society since 2007 and the Mendocino-Lake County Medical Society since 2010. The three boards of directors have several meetings planned to look at current organizational structures and consider options for 2017 and beyond. Click here to view Melody's departure letter. Dr. Enrique Gonzalez-Mendez was featured in the Press Democrat recently for his utilization of culture in patient treatment. A family physician in Santa Rosa and a clinical professor at UCSF, he delivers health care that honors a patient's social, cultural, linguistic and spiritual needs and is teaching other doctors how to honor the cultural needs of the underserved. For more than 30 years, Gonzalez-Mendez has been treating low-income patients at the Vista Family Health Center and modeling cultural competency for medical students affiliated with the Santa Rosa Family Medicine Residency, sponsored by Sutter Santa Rosa Regional Hospital and affiliated with UCSF. Click here to read the full article. Nondiscrimination statement posting Physicians who provide services to Medicare or Medi-Cal patients must comply with new nondiscrimination posting requirements effective Oct. 16, 2016. To answer questions regarding compliance, CMA has created an FAQ resource to help guide members. New update on HIPPA and cloud computing The U.S. Department of Health and Human Services Office of Civil Rights (OCR) recently released an updated "Guidance on HIPPA and Cloud Computing" for the storage or transmission of electronic personal health information (ePHI). If using a cloud service provider to maintain ePHI, a HIPAA-compliant business associate agreement is required to avoid a HIPAA violation. For more information, see CMA On-Call document #3301 "Physician Use of Mobile Devices and Cloud Computing." On-Call documents are available free to CMA members. Medical weight-loss practice for sale / fall in love with practicing medicine again Proven, highly recognized and profitable, established weight-loss practice in beautiful Marin County. Current multiple 6 figures, room for expansion. Work-life balance, time freedom, financial security, relationship-driven practice. I am 100% committed to assisting the new owner with all the support necessary to ensure a smooth transition. Please contact me for more information or to schedule a visit. Gail Altschuler, MD, 415-309-6258 or drgail@marinweightloss.com.